CBSE Schools In Ahmedabad: When it comes to their children’s education, every parent wants their child to study in the best school possible. But searching for a good school is an uphill task for parents. Especially when you move to a new city or are planning to move to a new city, this becomes one of your biggest concerns. You have no idea about the good schools in that city. But your child needs to change school and you cannot afford to make the wrong decision. Thus, proper knowledge of the schools in the city will help you choose the best school for your child. To help you with this, we are compiling the lists of best CBSE schools in the major cities in India. If you are looking for the best CBSE schools in Ahmedabad, you are in the right place. Go through the article and find out the list of CBSE Schools in Ahmedabad. CBSE is a national level board which most of the parents/students prefer. It is well known for the quality of education it provides. Also, CBSE recommends the NCERT curriculum based on which various national level competitive exams are conducted. Engineering and medical entrance exams like JEE (Main) and NEET are based on the CBSE syllabus. Even Civil Service aspirants have to study the NCERT textbooks of various subjects. It is for this reason CBSE is the most popular board in India. Udgam School For Children Opp: Sardar Patel Institute, Thaltej Tekra, Ahmedabad – 380054. A.G. High School Navrangpura, Ahmedabad – 380009. 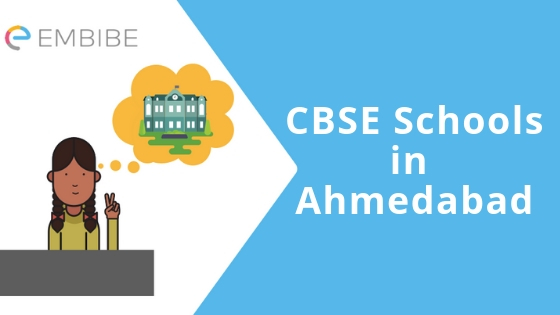 You are now aware of the renowned CBSE schools in Ahmedabad. Check out the official websites and visit the schools in person before choosing the right school for your child. Choosing the right school and providing proper guidance at home can enable a child to reach his/her fullest potential. And this is especially important when the child is young. Because that’s when the academic (and moral) foundations are laid. What a student studies and learns at foundation level, i.e. in Class 8, Class 9 and Class 10, plays a vital role in determining their future. Schools play a huge role in this and hence, must be chosen properly. Also, Class 8, Class 9 and Class 10 students can solve CBSE practice questions and take CBSE mock tests for Science and Maths on Embibe. These are available for free and will help in improving their knowledge and problem-solving abilities. We hope this article on CBSE schools in Ahmedabad helps you. If you have any question, feel free to post it in the comment box below. We will get back to you as soon as possible.